I think I am going to flush my cooling system. 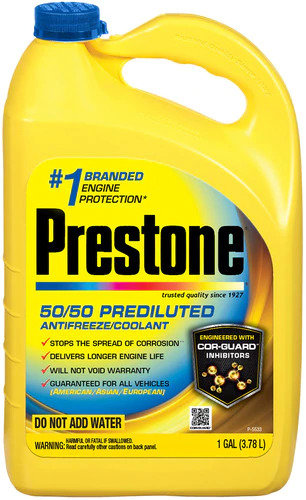 What is the recommended brand anti freeze do I use? The most important thing to read is the Flash point 220 Degrees these cars run hot during the Spring and Summer months. I have had no problems. Prestone, Peak or Zerex green/yellow are good brands. Wal-mart has their own brand which in my opinion is just as good - I use that. If you mix it yourself, use distilled water or you can be adding unneeded minerals that promote rust. All good advice from the various people that posted. Investigate the other products, specifically the flush/clean products. I recommend draining enough coolant from the radiator and introducing the flush/clean products and run that for several trips and prior to your anticipated flush. If the timeline between flushes has been excessive, you may also want to consider replacing the thermostat at this time. I find that the 180 degree big mouth thermostat to work best for my car. Consider removing the heater hoses at engine end and backwash/backflush the heater core too. The cooling system in these cars is very important and something that should be serviced regularly. In my opinion, you can't do it too often. I also am one that purchases the concentrated antifreeze formula and the distilled water as I feel I save money taking that approach.